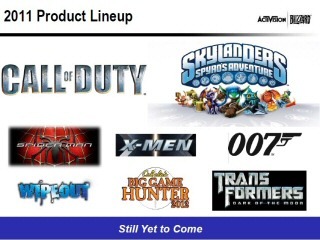 On a shareholders conference call to discuss Q1 earnings earlier today, Activision announced their next James Bond game will be released in the latter half of 2011. Eric Hirshberg, CEO of Activision Publishing, said: "For the balance of the year, we plan to launch games based on the best-selling X-Men and Spider-Man franchises, James Bond and the toy phenomenon Bakugan as well as the latest release in the long-standing Cabela's Hunting franchise, which we're expanding this year to include new peripherals and an incredible Kinect experience..."
"I'm looking forward to updating you on our plans and performance as this exciting year unfolds. And we'll have a lot more details on our upcoming releases to share with you in the coming weeks and in E3." Above: Slide from the Activision conference call. Hirshberg concluded, "Our strategy of creating more in-depth and quality gaming experiences within fewer, better franchises appears to be paying off." As first reported on MI6 back in early December, a new James Bond had already been under development for a year but was suspended by Activision for six months due to MGM's financial situation. As that was eventually resolved, and a green light given to Bond 23, it is understood that the game's development was also resumed. Activision-owned studio Raven Software were reportedly working on the game in 2010 before resources were redirected to produce downloadable map packs for the immensely profitable "Call of Duty" franchise. Eagle-eyed fans subsequently noticed Raven Software listed in the "Blood Stone" credits, alluding to collaboration between the studios on 007 assets. Just a day later, MI6 also revealed the first look at the James Bond title in development at Raven. Activision have yet to announce which studio is behind the next game, the platforms or a firm release date. Most industry press are assuming the Raven project is back on track, although a few suggest Eurocom's success with "GoldenEye" on the Wii would make them front-runners. 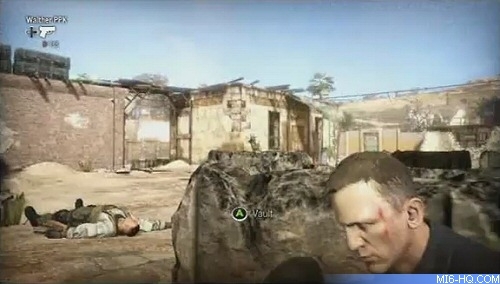 Above: An early look at the Bond game that was in development at Raven Software in 2010 - it may be the game scheduled for release later this year. Click here for more.